This is the least dessert-ish of the AF flatbreads we've sampled thus far: the Chocolate & Strawberry one being at the sweet end of the spectrum, and the Pear & Gorgonzola one being somewhere in the middle. This one could be served as dinner or as an appetizer. It sits a bit heavy in the stomach, and the tomato flavor is pretty strong for me, and for those reasons, I would say it works better as an appetizer. But some people would probably disagree. I've mentioned in previous posts that I'm not a huge fan of raw tomatoes, but cooked, stewed, or dried tomatoes I'm okay with. I also like most tomato derivatives like marinara sauce, ketchup, and tomato soup. The sun-dried tomatoes on this product are plentiful, and they taste a good bit like raw tomatoes. It wasn't a deal-breaker for me, but I think I would have preferred just regular old pizza sauce. You tomato-lovers would probably enjoy them. They're basically tomaisins, the tomato equivalent of raisins, with a comparable shrivel-factor, texture, and size. Thus far, pretty much all AF pizza and flatbread doughs are apparently created equal. So, no surprises with the crust. There were little pockets of mozzarella and Gouda here and there, and there was a good amount of diced chicken breast. 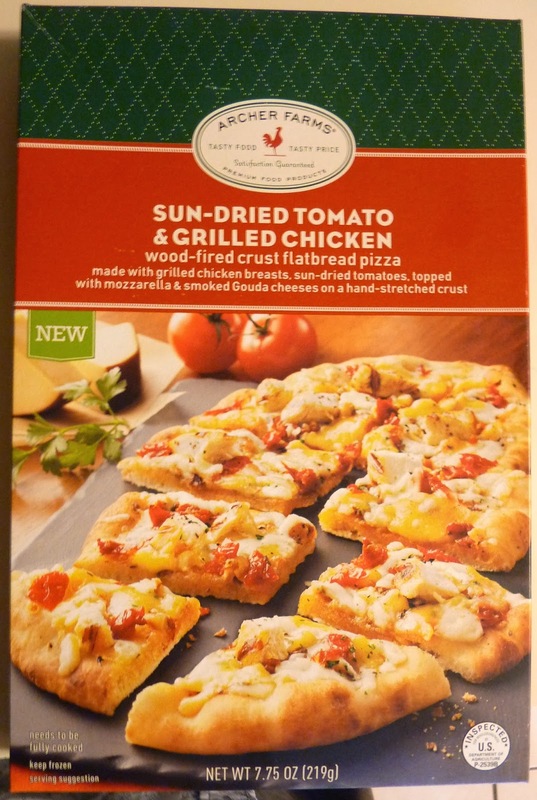 All the elements combined to make a nice, fresh-tasting chicken pizza. I'd say the product is a little too big for one person to eat in one sitting, and yet it's not big enough for a meal for two. So again, it works best as an appetizer in my opinion. You could probably couple it with soup and/or salad to make a well-balanced dinner. I think it was around five bucks, and it heats in less than 15 minutes. 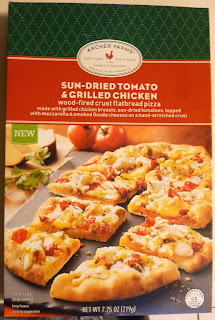 All in all, it's not a bad purchase, though not quite as novel as the other flatbreads we've tried. I give this flatbread 7 out of 10 stars.